Terry Uyeyama was born in 1935 in San Francisco, California. He was commissioned through the Air Force ROTC program on January 27, 1958, and went on active duty beginning February 27, 1958. Lt Uyeyama then completed Undergraduate Pilot Training and was awarded his pilot wings at Laredo AFB, Texas, in April 1959, followed by B-47 Stratojet Combat Crew Training. 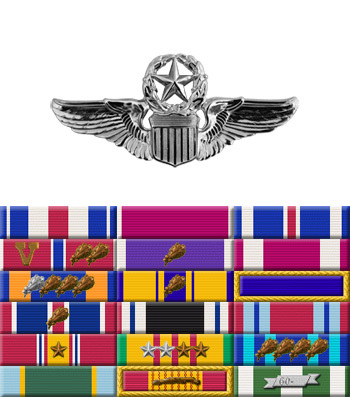 His first assignment was to the 19th Bomb Squadron of the 22nd Bomb Wing at March AFB, California, from June 1959 to August 1960, followed by Pilot Instructor Training and service as an instructor pilot with the 3560th Pilot Training Squadron at Webb AFB, Texas, where he served until July 1965. He then completed Fighter Interceptor Training before serving as an F-102 Delta Dagger pilot with the 59th Fighter Intercepter Squadron at Goose AB, Canada, from February to December 1966. Capt Uyeyama next completed RF-4 Phantom II Combat Crew Training and was assigned to the 14th Tactical Reconnaissance Squadron at Bergstrom AFB, Texas, in December 1966. He deployed with the squadron to Udorn Royal Thai AFB, Thailand, in October 1967, and was forced to eject over North Vietnam while flying his 101st combat mission on May 18, 1968, and was captured and taken as a Prisoner of War. After spending 1,761 days in captivity, Maj Uyeyama was released during Operation Homecoming on March 14, 1973. He was briefly hospitalized to recover from his injuries at Lackland AFB, Texas, and then went back on flying status. 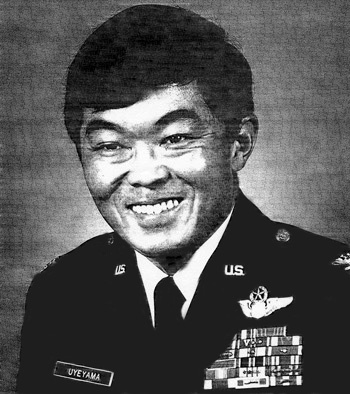 Col Uyeyama served with the 67th Tactical Reconnaissance Wing at Bergstrom AFB from March 1974 to July 1978, and then served at Lackland AFB until his retirement from the Air Force on June 18, 1980. Captain Terry J. Uyeyama distinguished himself by gallantry in connection with military operations against an opposing armed force as an RF-4C aircraft commander over North Vietnam on 19 February 1968. On that date, Captain Uyeyama displayed outstanding aerial competence and courageous professionalism in the aggressive pursuance and acquisition of the assigned targets. The tenacity of this officer to attain the objective against formidable defenses is in accord with the highest military objectives. By his gallantry and devotion to duty, Captain Uyeyama has reflected great credit upon himself and the United States Air Force.